This is gonna be quick because you gotta go shopping – and fast! 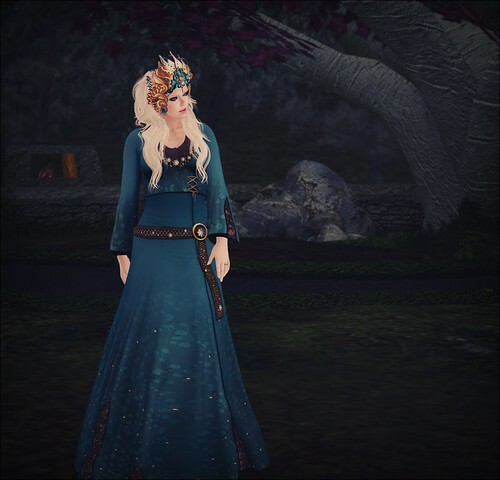 Junbug is at The Liaison Collaborative this month with the super pretty Mademoiselle Coco gown. The front has a floral design that goes straight down, but it was a wee bit too low cut for me on the bodice [I kept seeing areola no matter what I did!] and I thought the back of the dress was more interesting, so that’s what I chose to show off here. Project Limited opened yesterday and it’s just as it sounds – All the items are LIMITED! Cae is there with the D’Anjou jewelry set and you need it! I honestly cannot tell you how many are left at the event, so you need to run there right away if you want this gorgeous jewelry. Like pretty much all of Cae‘s products, it has a HUD so you can change some of the colors of the jewels and metal. But once it’s gone, it’s gone, so go go go! We’re coming up on a new week and it’ll be a good one because a new round of The Liaison Collaborative is starting on the 15th! I’m so very much in love with the I Will Break Your Heart dress by Valentina E. It definitely isn’t breaking my heart! In fact, it’s so ruffly and girly, it’s making my heart happy! And it fits perfectly over mesh bodies! I never thought that would be a big deal for me but I’m totally loving wearing mesh bodies lately and it’s important that my mesh clothes fit on them. The Liaison Collaborative opens on the 15th and there will be lots of clothes, poses, and all kinds of goodies for you to shop for! Life is not a song, sweetling. I was super thrilled to be invited to be a blogger for Tales of Fantasy! I adore fantasy style outfits, but I don’t always know what stores to shop at or anything, so an event like this was really good for me! And even better, the theme for this round is Game of Thrones and that is REALLY exciting to me! FDD is a new-to-me store that has a gacha out at Tales of Fantasy this month where you can collect the Heiress of Throne set. There are a few colors of both the skirt and the jacket to collect. The belt and the collar are rares and have a HUD to change the colors of the stones and fabric of the items. There is also a rare necklace in the set, but I’m not wearing it in this photo because I didn’t see it until it was too late. 😀 The crown is an ultra rare, but I think it’s pretty dang cool! It also has a HUD to change the colors on the crown. Tales of Fantasy opens on December 10th, so remember to head out there and get your fantasy life! I Just Can’t Seem To Shake You, Emily. One rule I’ve always had is “DEMO. DEMO. DEMO!!! !” But on occasion, I forget. It never really ends well. Case in point… this absolutely beautiful dress from B.C.C.! The Emily Romantic Corset Dress by B.C.C. for The Seasons Story is lovely and so completely my style. I was so excited to wear it while we’ve been on vacation that in my haste, I didn’t demo. Unfortunately, the dress is “standard sized” pretty much in name only. The Small does fit me, but then I noticed something really really wrong with the arms. 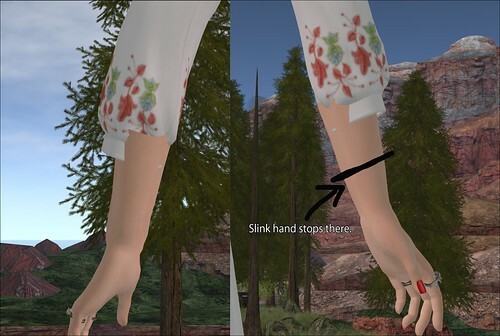 At first I thought it was my Slink hands because sometimes longer sleeves don’t fit quite right over them. But as you can see, my hands stop well before the sleeve starts. I tried moving up to a size Medium, but for some reason, that made the dress completely jam into my shoulders, although the opposite should have been true. I even went up to a size Large, which was not really that much larger than the Small and came with its own set of issues. Then I tried changing my shape, but that didn’t really work that well. I sent a notecard to the creator a couple of days ago to ask if maybe I could get a new alpha that goes down a little further on the sleeves, but I don’t know how much that’s going to fix the problem and I haven’t heard anything back anyway. That all being said, this dress is really really pretty. If you want to buy it, definitely demo it first! One awesome thing about our Grand Canyon vacation is that we have a bakery just a little ways from the lodge. So when I don’t want to make the bigger hike up to the coffee shop, I can pop in here and grab a cupcake. Because really? Hiking in heels is not for the faint of heart. I really think the Rayna jumper from Drift for The Liaison Collaborative this month is adorable! It’s very simple, but there are HUDs so you can change the color and the fabric of the jumper. I’m wearing it in blue tweed, but you can also wear it in a different color and a cotton fabric. Ingenue released the Grady heels for Collabor88 this month, and they’re just perfect! I should have gotten a better shot of them [sorry, I have vacation brain] but there is a tiny little key hanging off of the button on the strap. So cute! You will need the Slink medium feet for these.